Bolton, United Kingdom – Solids handling equipment maker, Ajax Equipment, announced a new type of silo cascade mixer enabling batch powder processing in squat, square mixing containers in place of tall conventional conical hoppers, for plants where space is limited. The mixer combines mass flow and intake recycling screw technology that minimises power consumption whilst providing efficient mixing. The Ajax silo cascade mixer uses vertical screws to elevate the powder, cascading it on the bed contents and down the hopper section. The recycling screws have a large entrainment diameter and a twin inlet scoop that reduce the headroom requirement of the hopper section, enabling relatively large volumes of solids to be held within the squat mixer. The recycling screws are fitted with variable pitch, varying diameter flights and have conical centre shafts. This construction captures product in a progressive manner to accentuate the mixing process and avoid shearing through a static bed. The mass flow mixer construction ensures that a reliable and predictable flow pattern is attained to counter any tendency for segregation, which is a potential hazard on recycling equipment handling dry granular products of variable particle sizes. The recycling screw casings are fitted with a hinged inspection/access door on the sidewall of the mixer. The doors are equipped with safety switches that are interlocked with the drive motors. Two Ajax Cascade Mixers, 5.5 metre cube capacity site rated Atex zone 21, internal Zone 22. Ajax has supplied multiple 5.5 metre cube silo cascade mixers for blending a plastic compound. These were designed for installation in an area rated as ATEX Zone 22 (dust) with the internal of the blenders designated as Zone 21 (dust). The mixers also included two alternative discharge ports, each of which were required to totally empty the contents within 5 minutes. 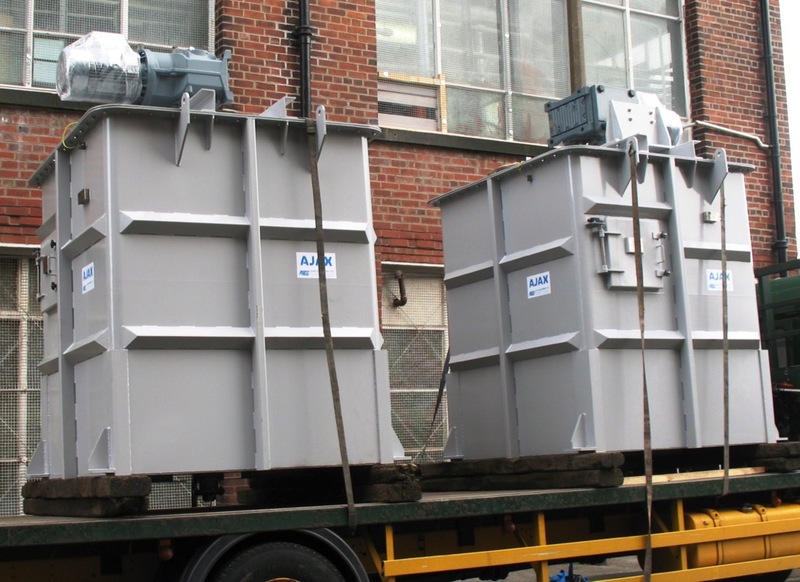 In addition, a number of replacement recycling screws were also supplied to replace unsuitable screws on 10 Tonne capacity mixers that had been supplied by others.